Planning for events in rural Alaska always carries the caveat “weather permitting.” That was the case Monday, as new Alaska Gov. Mike Dunleavy’s swearing-in ceremony didn’t go according to plan. Fog prevented Dunleavy’s plane from landing in Noorvik in time for his swearing-in ceremony. So he was sworn in where his plane did land: Kotzebue. But that didn’t stop the community of Noorvik from going ahead with its plan and holding its own event, blending songs, speeches and prayers in English and Inupiaq. The event was held at Noorvik’s school, and the fourth and fifth-graders participated, singing “My Country ‘Tis of Thee” in Inupiaq. Dunleavy and Lt. Gov. Kevin Meyer took their oaths of office more than 20 minutes before the noon deadline set in the state constitution. After the fog cleared, Dunleavy, Meyer and other visitors were able to fly the roughly 20 minutes to Noorvik for an inaugural feast. He arrived in time for the feast that residents planned. 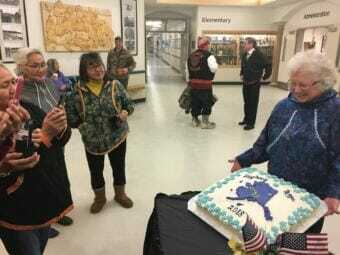 Dunleavy chose Noorvik for the event because his wife Rose Dunleavy grew up there. The family received a warm welcome. Mike and Rose Dunleavy now live in Wasilla, although they’re moving to the governor’s mansion in Juneau this week. The governor welcomed Noorvik residents to the capital. Rose Dunleavy was the focus of much of Noorvik’s pride in the day leading up to the event. She is known by her Inupiaq name, Sattu, in Noorvik. Alaska’s new first lady said she likes to return to her home village. “Oh, it feels good,” she said. “It feels really good — just, it came back,” referring to the feeling of being home. The Dunleavy family and other members of the new governor’s team flew back after spending a little more than two hours in Noorvik. KNOM’s Katie Kazmierski and KTOO’s Jeremy Hsieh contributed to this report.